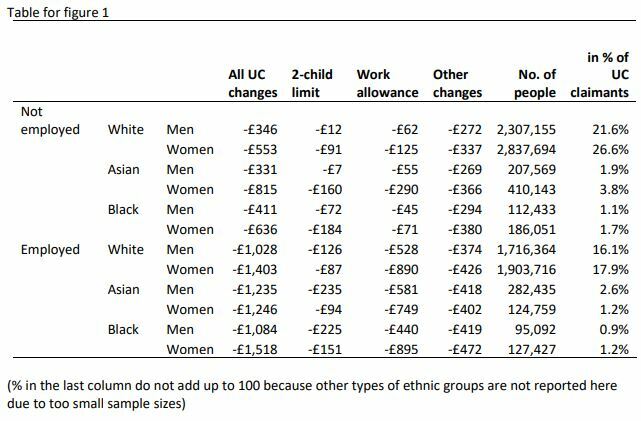 Low paid workers will lose the most from cuts and changes to Universal Credit with women and ethnic minorities hardest hit according to new analysis published today. By April 2021 employed individuals who live in households claiming universal credit will be £1200 a year worse off than they would have been under the original UC system. 57% of the loss is due to the cut to the work allowance. Claimants not in work will be around £500 a year worse off. Women will lose more than men: 2.2 million female claimants in employment would lose an average of £1,400 a year and 3.6 million female claimants not in employment would lose an average £600 a year. The most affected are the 230,000 one-earner couples with 3 or more children who stand to lose £3891 a year, followed by the 132,000 two-earner couples with three or more children (£3287 worse off). That is more than 1 million children in working families affected. Asian families with three or more children will lose over £1,370 on average from the two child cap alone (more than 100,000 families affected). The changes in Universal Credit come on top of a series of other cuts and changes to the benefit and tax system which have disproportionately affected women, and Black and Minority Ethnic (BME) women in particular. 5.9 million women living in households eligible for universal credit under 2013 rules will lose £4406 a year by April 2021 as a result of the combined impact of all changes to benefits, tax credits, universal credit, income tax, NICs and the National Living Wage introduced since June 2010. Black women, whether employed or not stand to lose £5030 a year. In relative terms this amounts to 28% of the net individual income of those not in employment and 20% of those in employment. Asian women not in employment will lose 32% of their net individual income (20% for those in employment). 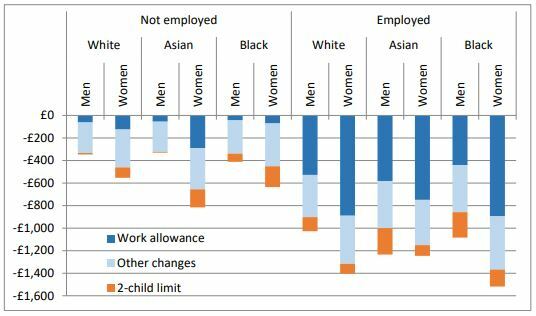 Employed women will lose over ten times as much from cuts and changes to benefits and tax credits as they will have gained from the increased National Living Wage and personal tax allowance (12 times as much if they are black). Again, our analysis of Universal credit claimants shows the devastating impact that austerity is having on women and BME women in particular. Women on Universal Credit stand to be £4000 a year worse off by April 2021 from all tax and benefit changes since 2010. Black women are losing the most: £5000 or 12 times as much as they gain from the National Living wage and increased personal tax allowance. The government should take urgent action to put the roll out of Universal Credit on hold until it is fit for purpose, end the benefit freeze. In particular it should lift the arbitrary two child cap that is a direct attack on the human rights of younger siblings. Previous research from our two organisations has already shown that women and BME groups are the hardest hit from austerity. 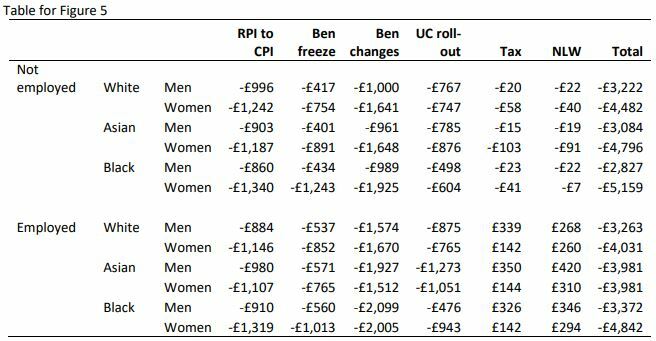 What this new data shows is that there is an additional penalty caused by Universal Credit, which is taking even more money away from low income groups and hitting women and BME citizens harder, and BME women hardest of all. We call on the Chancellor to ensure his budget is fully equality impact assessed, and that he introduces measures that reduce this unfairness. Universal Credit income is shared equally within couples. the Family Resources Survey samples of 2012/13, 2013/14, 2014/15 and 2015/16). Key to reading figure 1: This figure shows how men and women of different ethnic groups are affected by the changes to Universal Credit compared to what they would have received in April 2021 under the 2013 model. 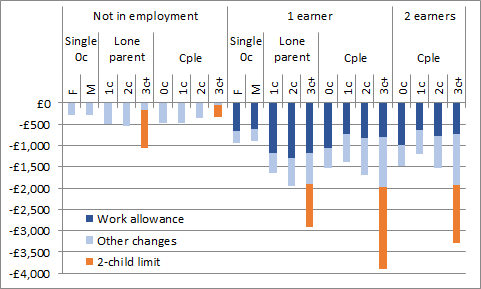 Since UC is a single-payment household-level benefit, allocating its amount to individuals can only be done arbitrarily as couples cannot split the payment (except in Scotland). We have assumed an equal split between two partners in a couple. The differences between men and women are mainly to do with the effect of lone parents being overwhelmingly women. 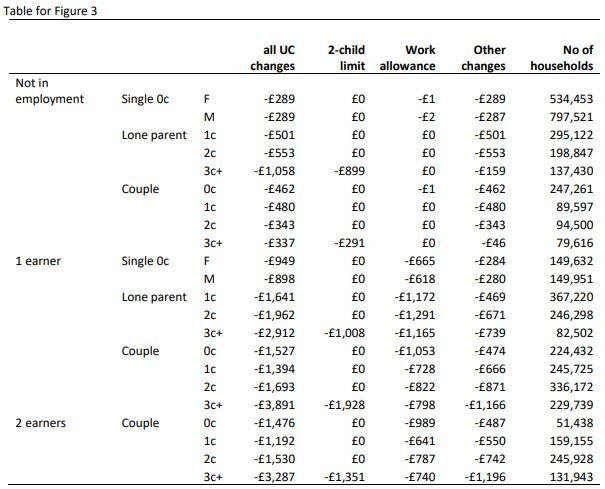 Key to reading figure 2: Families with three or more children will lose more than £2500 a year on average from these changes with Asian large families losing the most. 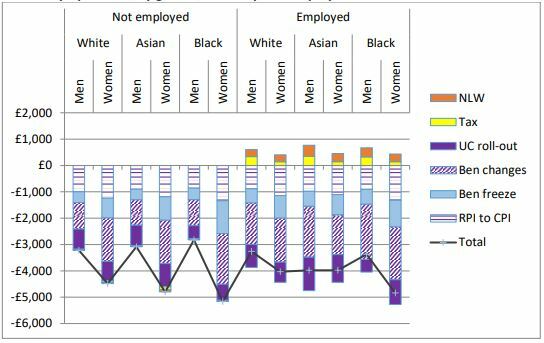 Key to reading figure 3: This charts shows that women who are not in employment lose more than men and BME people lose more than white people as a proportion of their income. 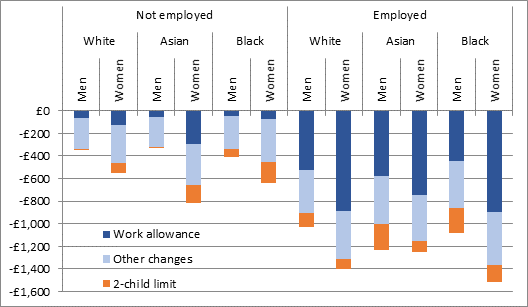 The combination of race and gender means that Asian women not in employment claiming universal credit will lose 32% of their income as a result of all tax and benefit changes since 2010. 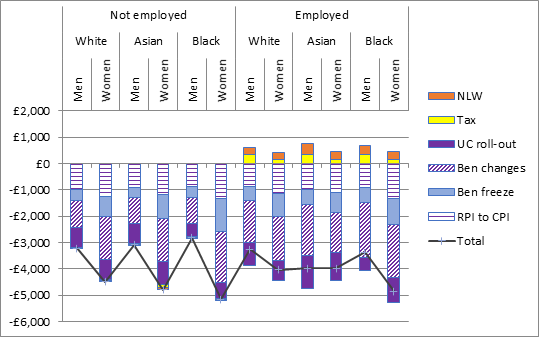 Key to reading figure 4: Black women in particular – whether employed or not employed – stand to lose the most, with a net annual individual income in April 2021 projected to be lower by £5000 to what it could have been had the April 2010 system been carried on as planned. 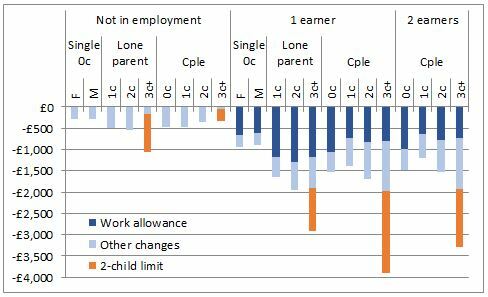 The impact of the benefit freeze and of the change in uprating indexation accounts for almost half of the changes. The effect of the 4-year freeze has been made worse due to higher inflation forecast than at the time of the decision in July 2015.